Send them a mail direct and tell them that it is for their MechMate kit. I have ordered from France the complete set. I have received it 5 days after. Great vendor. Thank you Gerald. Thread bumped for Leandro in Brazil. Superior have supplied around 30 sets of these bearings for MechMate builders, and everyone seems very happy with Rick's service. I am checking to see whether the pricing may have been revised. Just ordered mine, same price. Rick says he had over 30 Mechmate customers so far. was curious if anyone knows what the current pricing for the package was, or if they were still doing it. anybody ordered lately? i sent out an email to them but wanted to check here as well. i assume they arent part of it but i'm not sure why you would include them in that list if they arent needed. Last edited by baseball43v3r; Tue 16 September 2008 at 20:59.. Some people got the wrong idea that they need Plain bushes for the wheels that do not use Eccentric bushes. just an fyi, i got a reply from rick and the prices are still the same as before for anyone that was wondering! why do we need the eccentric bushings? so that the grantry doesnt jump out of track? why cant we use skate bearing? You use the eccentrics so you can make adjustments to insure the Z is perpendicular to the table so that the router/spindle will cut correctly. The eccentric bushes go inside the bearings of the z-slide. They allow you to adjust the position of the bearing from left to right. Has anyone recently got bearings from Rick @ Superior Bearings, as I dont get any reply from him. Tried 3 times the last week & a half to e-mail him, no luck in a reply? Yes 2 weeks ago i asked for prices and got answer. Yep, Got my order delivered about 2 weeks ago and finished the new z slide last night. Just to let you guys know that the bearings and eccentric bushings went up a little. Would appreciate if someone could please help. I also tried getting in contact with Rick. Emailed him twice and no reply yet. iclazion, I just got off the phone with him a few hours ago. It sounded like he was swamped with a few projects when I called. He said they have the Mechmate Kits on hand and that they would ship out fast. I am just waiting for the email saying how much shipping is. That is really good news Regnar. Would be appreciated if I could get a shipping cost to South Africa. At long last my motors, drivers, breakout board and voltage regulators are on their way. Is there someone on this forum willing to sell a complete set. I don’t want to wait up on a miracle before they respond to my email. 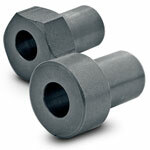 I would like 14 “Guide Wheels” – GW3; 6 “Eccentric Bushings” – B3X. Also please give me a quote on the v-rails. Shipping will be to South Africa. Thank you. I Would appreciate it if there is someone willing to help. Design since changed for optional 14 rollers and 6 eccentric bushings. I think we can add 2 Centric bushings? for the two fixed bearings top and bottom left or right. Last edited by isladelobos; Mon 20 December 2010 at 09:26.. I found that i needed full travel on the eccentrics to get the proper z 0,0 relationship to the y-axis. Is Rick still supplying bearings for Mech Mates? I need to upgrade my home made wheels. Has anyone ordered these parts recently and can provide the cost? Give him a call. He is good to deal with.